Geoglyphs are classified as rock art, which also includes pictographs and petroglyphs. Pictographs are rock paintings while petroglyphs are rock engravings. Cave paintings, drawings, petroglyphs, geoglyphs, hieroglyphs and more have been used all over the world for centuries. Created by the ancients and left for us to explore and ponder, these symbols held great meaning for those civilizations who created them. Some, like the Egyptian Hieroglyphs, we know to be the cultures written language. Others, like cave drawings, express the daily lives or held religious significance for their designers. There are many however that offers more questions and possible answers then one mind can conceive. Among these are the great Geoglyphs found in locations around the globe. 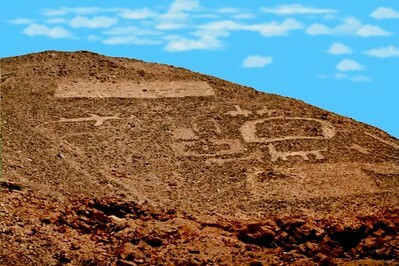 In South America, the lines at Nazca are of the most famous geoglyphs, but they are hardly the only ones. South of Nazca, about 850 miles, is perhaps the world's largest human figure, etched into the side of Solitary Mountain. The Giant of Atacama at Cerro Unitas, in Chile, about 600 miles south of Nazca, is an incredible 393 feet high and is surrounded by lines similar to those at Nazca. Just 130 miles from Nazca, dug into a sloping hill at Pisco Bay on the Peruvian coast. This drawing looks very much like a candlestick - which gives it the name of "The Candelabra of the Andes". There has been much speculation about the purpose of the 595-foot high candelabra, but no definitive answer. It is constructed in a different manner to the Nazca lines, using trenches up to one meter in depth, and is best viewed from out at sea. It can be seen from as far away as 12 miles. Pottery found near the figure has been carbon dated to 200 BC. Interestingly enough, the Incan city of Cuzco was created in the shape of a puma. Its inhabitants were known as "members of the body of the puma". The English geoglyphs, like the White Horse of Uffington, England, are mostly chalk figures. In Oxfordshire, England, a layer of soil and mossy vegetation was chipped away in the shape of a 360-foot-long horse to reveal the white, underlying chalk. These require constant maintenance to stop them disappearing back beneath grass and soil. This lack of durability means that many others are bound to have disappeared centuries ago. Who knows how many have been lost to us through the years? Why were these designed? It would seem logical that these ancient civilizations had much more to be concerned with then giant works of art. Were they messages to their Gods? Possible since most appear to be best viewed from the sky or at great distances. Were they a remembrance of ancient times before them when flight was possible? Around the world there are references of great-lost knowledge and a powerful civilization, ancient even to those we now consider ancient. Atlantis perhaps? Is there a connection binding them we have yet to understand? New thought is finally emerging in the study of sacred, ancient mysteries and the way these stories appear to be repeating themselves. With thousands of amateur and professional archaeologists sharing discoveries online, similarities are being discovered in some Native American rock-art symbolism and that found in other parts of the world. This means ancient people from other cultures could have migrated here thousands of years ago (or vice versa). Most interesting are those experts who find geoglyphs interpretation that parallels myth and legend found in all of humanity. This suggest that all cultures on earth had origin from a common influence or had contact long before currently believed. In this section we will take a closer look at some of the remarkable geoglyphs, the regions around them and explore the many possibilities. Open your minds to old thinking, new ideas and what we have yet to even imagine. 23 Mar 2011 @ 06:10 by Hendon Harris @71.109.225.219 : Ancient American Art of Hindu Origin? carvings at the Ellora Caves in the early 1400s. Google "Ellora Caves"
You can access my work at chinesediscoveramerica.com or go directly to my article by googling "Ellora Caves Church Rock"
they are known today as the "Mound Builders". family of tribes (Plains Indians). How is this possible without Asian contact? 24 May 2011 @ 03:59 by Hendon Harris @166.205.139.97 : Why Are Geoglyphs Largely Ignored? program of how cultures are deemed to have developed over the millinea. Faced with evidence that doesn't fit what you've been taught or what you're teaching---ignore it. If you think this is an overstatement then I challenge you to google "evolutionary diffusionism" or "cultural diffusionism". it's more that a little awkward to explain highly developed societies that appear out of sequence. You might like to check this out, see the chinese dog on the right? This is the entrance to the mine. 29 May 2011 @ 15:19 by Arthur Faram @75.20.224.21 : Geoglyphs unlock the ancient past. There is a now book on the market that, using geoglyphs,sheds new light on Caral and Nazca peru. This is a book that promises to change history forever. Much of the speculation about the history of man over the past ten millinia is brought to light in Ancient Signposts. While researching his family history the author discovered an ancient secret which has been passed down by ancient civilizations for over 10,000 years. This secret is a window into man's past from before 10,000 BC until now. Once you start reading Ancient Signposts you will not want to put the book down. Ancient Signposts unveils the real purpose of the Egyptian Pyramids, explains why Stonehenge was built, uncovers the history of ancient man in the Americas, documents 10,000 year old land claims, reveals the true purpose of the Nazca lines in Peru, and much more. Over 200 documentary photos. evidences of previous advanced civilizations in that immediate area. www.chinesediscoveramerica.com or google "Hendon's geoglyphs"
How can anyone explain this away as a natural rock formation? 28 Oct 2011 @ 21:39 by Hendon Harris @71.109.154.128 : Is This King Ashoka? by googling: "news for 17th century Chinese coin dug up in Canada". to surface while the main stream academics continue to ignore it. by foot or pack animals. Its not magic. Its science. it happened. http://www.hinduwisdom.info/Pacific.htm or google "India on Pacific waves a tribute to Hinduism"
fan originates just below the waist on both bodies. Is this possible? Need more proof?? Google "Lizard Rock" Utah and then google "Newspaper Rock" Utah. Both of these sites are just a few miles from the geoglyphs in Colorado. symbols of Buddhism that are showing up all over the American southwest. 28 Jun 2012 @ 06:42 by Hendon Harris @71.109.218.31 : Sphinx Like Persian Manticore in Utah? ancient rock art and not simply the random erosion that most believe they are. While I was at Arches National Park near Moab Utah I made sure to personally see what at least two photographers are calling "The King" which is right next to the Double Arches and actually visible from the parking lot there. While there I made sure I took numerous photos of all sides of The King. 6 Jul 2012 @ 13:39 by Katherine @99.23.241.121 : Geoglyphs or earth art? If they are earth art, then wow, can mother earth paint!!!! south of the lake. For more information on this topic as well as satellite images of these grids along the eastern side of the Rocky Mtns google: "Phei Hsiu Zhang Heng" or "Joseph Needham Grid Collection". 13 Nov 2012 @ 05:56 by Hendon Harris @71.110.109.86 : Were the Anasazis Buddhists? astrological and navigational skills can not now be disputed. India and North America. Google: "Mandalas, Manjis, Mantras, Meridians and Monuments". is a most amazing site. Google: "The Canadian Goose Bisti" or "The Sleeping Lizard Bisti" or "the Flying Turtle Bisti". You can spend hours looking at these images that given their age are in incredible condition and seem to reinforce the argument that these "carvings" are in fact styles that originated from Vedic India and appear to have a definite Buddhist influence to them. Pool" and "Hoodoo Reflections" you will see the image I have mentioned framed between two other rock formations. were most likely made. In the history of the world what other cultures have been expert in detailed rock carving (especially certain types of features like those that are put on the tops of Buddhist temples like the Chattra and the Phallus Symbol) and are known for having traveled enormous distances to share their belief in Buddhism? How about the ancient Chinese court document that details the missionary trip of Hwui Shan and four other Buddhist clerics to the beautiful country they called FuSang? exception to this. Bravo!! Hopefully more scholars will research and publish their findings on the numerous apparent connections that have been found by others. go back to Zhang Heng and Phei Hsiu of the first and third centuries respectively. over in the late 1950's. Is that a coincidence or a historical pattern? While living and working in the Middle East, I documented two areas where the gravel desert was covered with thousands -- perhaps tens of thousands -- of small piles of stones. No pottery or artifacts were located nearby and none of the residents had any explanation; when asked they simply said the geoglyphs were 'very old'. I concentrated on two areas and the only thing in common was the proximity of burial mounds from the Hafit Period, approximately 4500 years ago. There was no evidence to support a link between the piles of stones and the tombs; as anyone who has travelled along the western slopes of the Hajar Mountains knows, tombs from the Hafit Period are numerous. I did not observe any array of stone piles near any other Hafit Period tombs. In one location, the stone piles appeared to be arranged to construct shapes by piling the stones in lines. However, the number of these shapes was almost insignificant given the number of stone piles. The piles were small -- about a half a meter in diameter -- and consisted of small stones, about the size of a fist. But there is no evidence the stones were sorted or arranged other than the construction of these piles. When mapped, the piles of stones did not resemble any shape. The stone piles were in areas, some very large -- a square kilometer or more -- and some very small -- perhaps 25 square meters in area. Dating the construction of the piling of the stones is difficult given the lack of artifacts but one can begin to estimate the dating by considering the climate and population numbers. Since no one seems to have any recollection of the piles being constructed, one might assume they are more than one or two generations old. If the construction -- which would have taken considerable time -- was done in the period after the arrival of the Europeans, notably the Portuguese, it is reasonable to assume the activity would have been recorded by the Europeans, notably the Portuguese who kept detailed journals. If the activity pre-dates the arrival of the Europeans, it seems illogical for a population that was almost always in search of water and food to spend the time and energy to construct piles of stones that do not seem to serve any practical function. I would be interested to hear from anyone who has any thoughts on the stone piles or who may have seen similar constructions. One example has been shared of stone pile constructions in Iceland. And there are small examples of similar small piles of stones from Nasca. However I have not uncovered any other location of such large areas of these geoglyphs. A copy of my discussion paper is available at Academia.edu. More information continues to be uncovered pointing to additional evidence of Pre Contact Asian cultural and religious influences in N America. Google: "Disqus Hendon Harris" and "Ancient Buddha Tree of Life Lotus Flower" for more information and the images of two geoglyphs near Egnar, Colorado that appear to be of Vajrayana (Tibetan) Buddhist origin. Some of these geoglyphs in N America are huge. Some like "The Harris Horse" almost defy imagination. But just because we don't know how they did it doesn't mean they didn't create this. Just that they were much more advanced than we have been told. Huge populations of people need a lot of water. Civilizations have handled this by building reservoirs. From high altitude (Google Maps) all bodies of water are either primarily blue or black. All recently man made lakes are black. The oceans and the Great Lakes are blue. The largest Black Water Lake in the world is Great Bear Lake in Canada. It's huge? However, if you look at this lake using Google Earth etc you can see a resemblance to a headless man. I say man because where on the body (shape) of this "man" where you would find male body parts they are there in exaggerated dimensions. In addition to that there are lakes in front of that feature. Its like something you would see on a bathroom stall wall. However, just in case you think I am seeing things that are of natural formation and I am saying they are man made look below one of the two legs. Google: "The Gang Deng Sea Horse Black Water Lake" for the image of a sea horse below that leg. Google: "Howie Harris Reclining Dog Black Water Lake" These are just a few of the Black Water Lakes that I believe were shaped as specific images in addition to being reservoirs made by ancient inhabitants of N America. 14 Sep 2016 @ 01:38 by Barnaby @125.162.209.77 : Thank you!